Poison Princess starts out two hundred and some days after the Flash. The world is not what it used to be and Evie is searching for a way to survive. When she stumbles into an occupied house, she sits down and tells her story. She takes us back to her high school, introduces us to her friends, and then tells us what happened before and after the Flash. Through the story we find out exactly who she is and what role she’ll play in the world. Set off to find her grandmother after the Flash, Evie is joined by an unlikely ally in the form of her old high school nemesis Jack. Together they begin a journey that will change their lives forever. This was my first Kresley Cole book. I know she writes a well loved adult series and while I’ve wanted to read it, I just haven’t gotten around to it. Poison Princess was a different read for me. There was so much going on throughout the whole book that I had to stop and reread parts just to keep up with the story. Kresley is very talented in creating a realistic and terrifying world. Her imagination definitely takes you on a ride! Evie wasn’t my favorite character. I know usually the main character is the one you love, but I didn’t really feel much for Evie. Well, I wanted to slap her a few times. I liked her well enough, especially when she tried to become more than she already was. I have to give her props for all the things she did for her mom, and how she tried to learn to be a better person. Once she started maturing a little bit, I starting cheering her on. Jack is not a typical hero of the story, which I kind of enjoyed. I can’t say that I loved him either but he had some interesting qualities about him and I liked how Kresley portrayed him. His whole fascination of us against them when it came to money kind of annoyed me a lot though. I mean after the Flash, does it really freaking matter Jack? Does it? You’re all just trying to survive! Get over it already and go kiss some Evie face or something. I really did enjoy parts of their relationship, especially when they got over themselves and became a little more like the characters I knew them to be! Overall, while I didn’t love Poison Princess, I did enjoy it. It was a crazy read, with a world created to blow you away. I’d be interested to see where this goes. The last few pages really kept me glued to the book, and that ending? THAT ENDING! I can’t believe I’m going to have to wait forever for book 2! 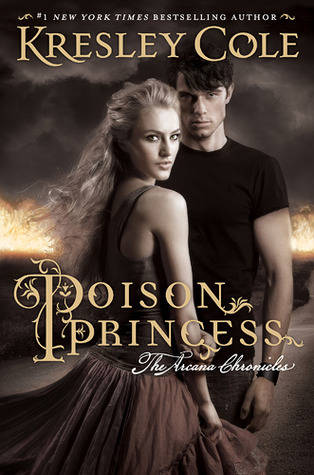 Poison Princess comes out October 2, 2012! I’d love to hear your thoughts! I've heard mixed things about this book. I do enjoy Kresley Cole's adult reads though, so I will definitely check it out!